Combine the marinade ingredients together in a large mixing bowl before dividing equally in to 4 smaller mixing bowls. Place the ingredients in to their bowls and allow to marinate for at least 30 minutes. 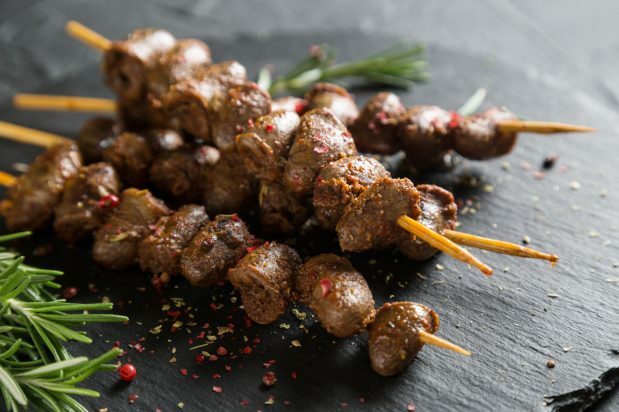 When the ingredients have marinated, skewer them and set aside. Heat up a charcoal grill and place the skewers on. Season them with a little salt and let them cook for about 10 minutes, moving the skewers around to avoid the fire from flaring up. When the meat has cooked, remove the skewers from the grill and serve!